Ethereum's decentralized social media manager. Stake tokens to tweet as famous people - on mainnet! 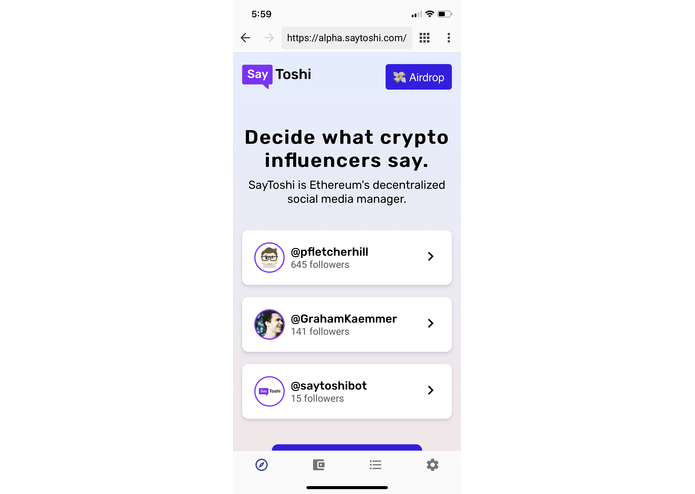 SayToshi lets crypto influencers make money from their networks by selling access to their Twitter accounts. 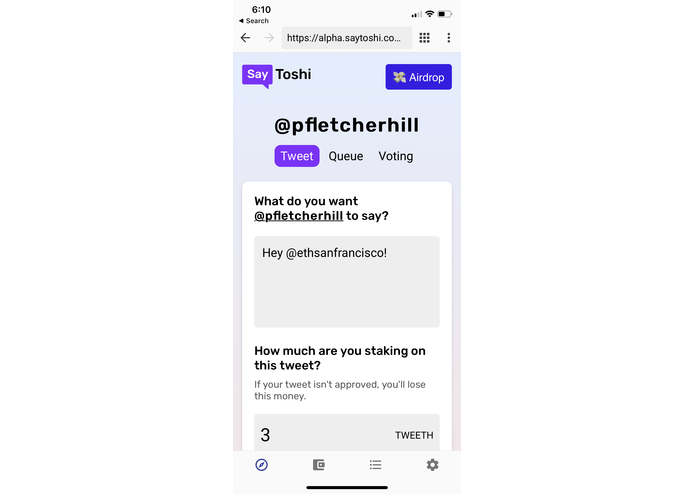 The SayToshi network is a decentralized social media manager, collectively deciding on what tweets to publish using primitives similar to a token-curated registry. SayToshi lets anyone monetize their social media platform. Crypto influencers connect their Twitter accounts to SayToshi and are paid as tweets are submitted for them. 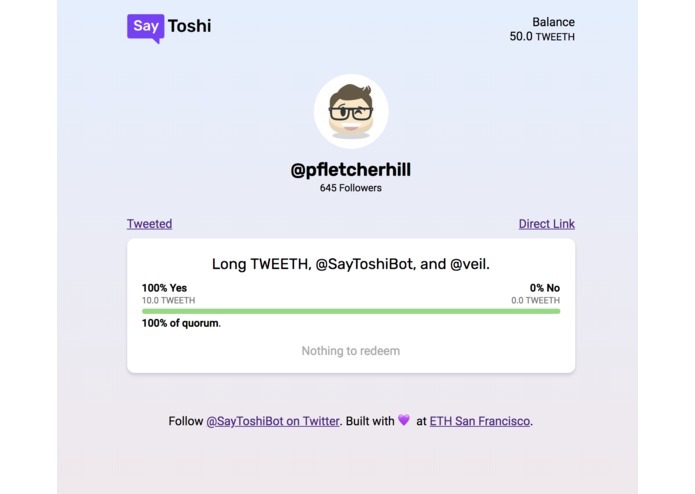 Anyone with a Github account can log in to SayToshi and claim their TWEETH tokens, SayToshi's native currency. Community members propose tweets for their favorite influencers and TWEETH holders vote on each proposal, similar to a token-curated registry. Proposed tweets that are accepted by the community are added to a tweet queue for each influencer. And every ten minutes an accepted message is tweeted. The money that was staked by the losing party (the "no" votes if the tweet is accepted, and the "yes" votes if the tweet is rejected) is redistributed between the influencer and the winning party. So users are rewarded for being good curators, and influencers are rewarded for offering up their platform. Frontend and design: We created mocks in Figma, and then designed using the standard frontend stack. Contract: We used the standard tools (OpenZeppelin, Truffle, Solium, Infura), with substantial time spent on testing. Our final contract is ~300 lines of code. User Acquisition: We created posters, and put them up around the venue (bathrooms, conference halls, stairs). We found a few crypto twitter celebrities at EthSF and asked them to connect their accounts. We also sent out on social media, such as Reedit. We wanted to build an incentivized social application that might go viral. There's also a lot of excitement in the Ethereum community about TCRs, but we wanted to show the potential benefits and risks of staking.